My coworkers went to eat at Press 195 and I placed an order for them to bring back. 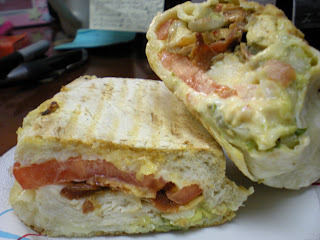 It was number 31 which was Turkey, Crispy Bacon, Monterey Jack, Tomato, Chipotle Mayo, and Guac. 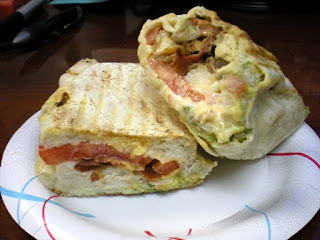 I substituted the Turkey with Grilled Chicken and instead of Ciabatta bread, I requested a WW Wrap but they were out so instead got a regular Wrap. Are you still with me? Look at the pics...would you have noticed??? That is so crazy they were two different kinds! Hmm at least they sound good! It looks good though. I'm glad you're feeling better.